Beaquilter: Which one should I make? Which one should I make? I know I just posted, but I want your input. 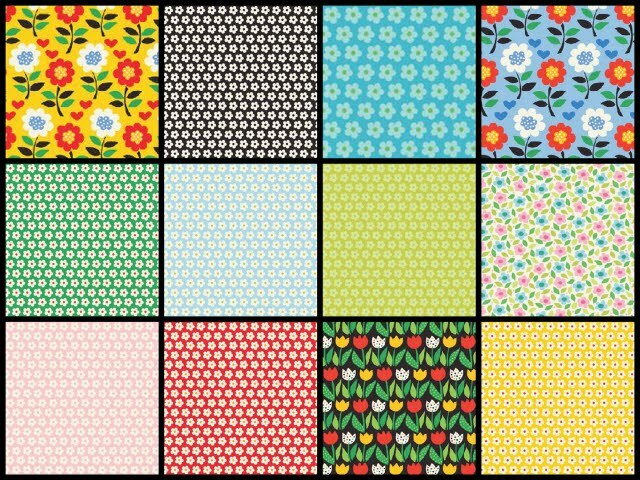 I am getting 1yd of each of these HEART AND HOME by Benartex. so what should I make? You have seen all these layouts before, but here they are again with JUST this line. You really want to make this hard don't you. I keep going back to #11. I think it shows off the fabrics really well. Good luck on picking one. I like 1, 4 and 7. Good luck choosing! I think you should have bought more fabric. They are all cute designs. I lean towards 2, 5, and 6. I'll pick 2 and 3, but all are lovely. Difficult choice but I like #2, #5 & #11. I really like the black sashing in #2. I like 1 and 2. #11 crosses or X's, #8 or #10 are my faves. I like 5 and 7. Actually I like number 7 but use the borders from number 2. I like 11 too, but 6 is also one of my favorites. I read and chose which I liked before seeing your thoughts. It appears we have the same taste because I chose one of yours you liked most. ummm, I'm not much help... 9, 10, 11, 12 are my faves. Is your goal to feature the line? That was my guess, so that's why I chose those quilts. What ever you do is goingn to be great! I like #2 also and the idea of #12 but not with the fabrics as they are depicted. Perhaps with a little change up, that one could be interesting. Good luck choosing. I love #6 and #12 but I think I would just have to close my eyes and pick one because they are all so great. I liked your design 9 an 11 best, I think. The black borders my be too dominant to the rest, if you understand. I like #2 and #10. I like 2 and 8. 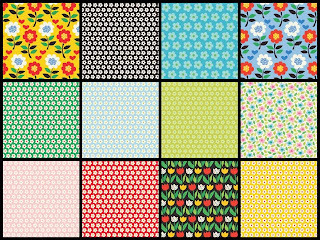 Great fabrics and I like #2 and #12! Thanks for sharing.